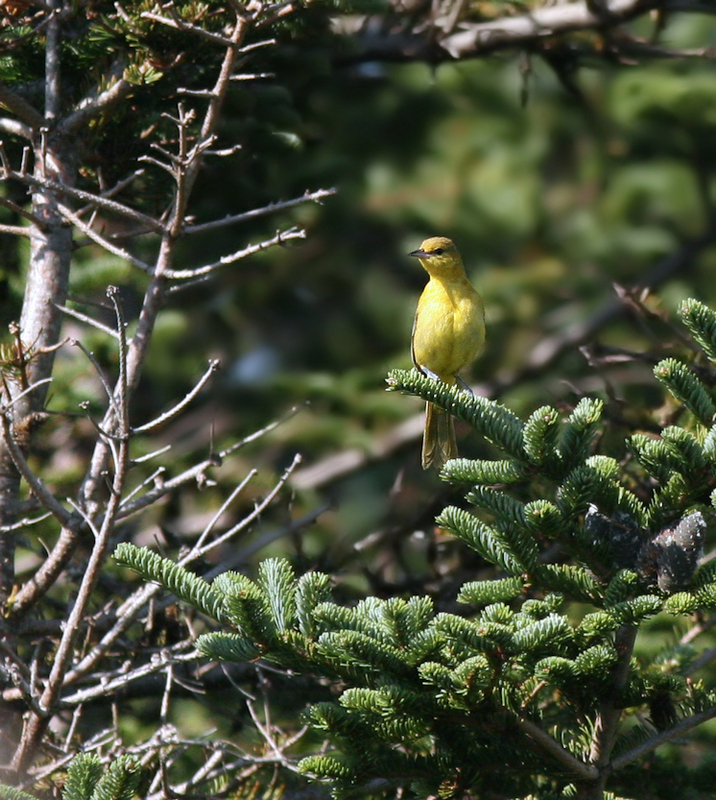 This female Orchard Oriole near Cappahayden in Fall 2011 was only the third confirmed record for Newfoundland, and the first to be photographed. Origins: Breeds across most of the eastern United States and Mexico, wintering further south into Central and South America. It is a rare but regular visitor to the Maritime provinces. Record Details: Six records for Newfoundland: (1) An immature male at Cheeseman Provincial Park (southwest Newfoundland) on June 13 1985 is widely considered the first convincing record for the province. (2) An immature female was observed well at Red Cliff (north of St. John’s) on September 13-14, 1991. (3) A female spotted near Cappahyaden on September 9, 2011 was the first to be photographed. (4) An immature/female individual was photographed near St. Lawrence on August 11, 2015, while (5) another was photographed on the East Coast Trail south of Cape Spear on September 6, 2015. (6) An immature was present at Cape Spear August 13-15, 2018 and seen by many. However, the history of this species in the province is slightly complicated, with a few other convincing (but unconfirmed) reports, including two from St. John’s in June 1975 and October 2002.